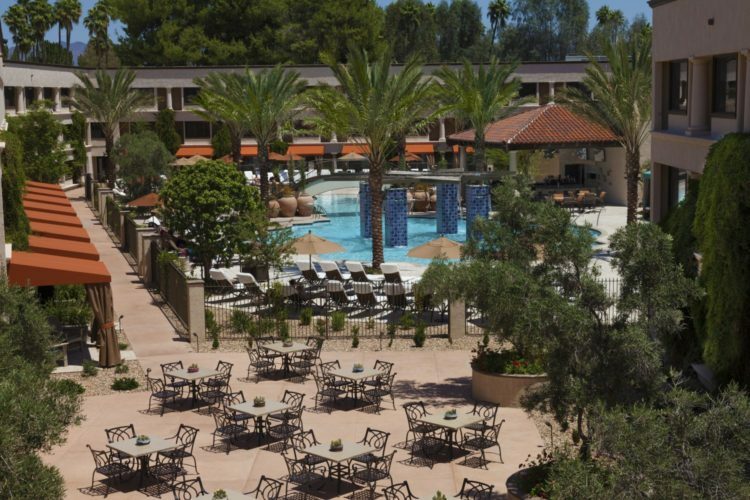 The Scottsdale Resort at McCormick Ranch is offering an exclusive room night offer just for AZFoothills readers. Whether you’re escaping a colder climate or are a local desiring a staycation, enjoy the spectacular spring weather in the lap of luxury at The Scottsdale Resort with rates starting at $249 per night in March and $169 per night in April. Centrally located in the heart of Scottsdale, The Scottsdale Resort at McCormick Ranch combines a luxurious modern sensibility with the tasteful elegance of historic southwestern haciendas. The majority of the 326 spacious guest rooms and suites offer expansive views of fairways, gardens and pools. While you’re there, have breakfast, lunch or dinner overlooking the resort’s expansive golf course at the seasonally-driven Kitchen West restaurant, or enjoy lighter fare with a can’t-beat happy hour at Bar Six40. To book your stay, please call 800-540-0727 and mention AZFOOTHILLS to receive this exclusive rate, or use the promo code AZFOOTHILLS when booking online by clicking here. Ditch the Beach Bod Worries and Celebrate Spring Break 2017 Here!